I first heard of The Allman Brothers Band in 1971. I was thirteen and just beginning to explore music beyond the Top 40 fare my hometown radio station offered. A couple of new arrivals in town, one from Atlanta, one from Macon, told me about the Allman Brothers. Their recommendation was enough to send me to the 5 &10 on Main Street that Saturday with my thin roll of bills in my hand. Live at the Fillmore East had just been released, although I had no way of knowing that. There was, of course, no internet, no MTV, and not even good FM radio in northwest Georgia in 1971. Even Rolling Stone could only be found in Atlanta. It’s hard to say what struck me most about Fillmore East, Duane’s slide playing or the dual leads he played with Dickey Betts, the willingness of the band to stretch out over an entire album side. But Gregg Allman’s voice was surely the first thing I heard. His voice would ring out at parties, high school parking lots, anywhere teenagers in the south gathered for years. It was at once exuberant and full of portent, a celebration of good times weighted with an awareness of what good times could cost. The history of the Allman Brothers Band is long and convoluted and has been told and retold by better writers than me and by people who were there. Alan Paul’s One Way Out is the best available history of the band from day one to the end. Gregg Allman penned his own autobiography and Duane Allman’s daughter Galadrielle has written a book about her father, the band’s founder and leader until his premature death in 1971, just a week or so after I purchased the Fillmore East album. But I am here to talk about Gregg Allman’s last album, the majestic Southern Blood. Gregg Allman’s solo career began in 1973 with Laid Back. He had a couple of songs, “Queen of Hearts” and “Multi Colored Lady” that did not fit the Allman Brothers template, so he cut them on his own with some of the other musicians who had migrated to Macon in the wake of the Allman Brothers’ success. A few covers, including a lovely remake of “These Days” by Gregg’s old friend Jackson Browne, and a few more originals, and Laid Back was yet another success at a time when the Allman Brothers Band could seemingly do no wrong. Allman, dedicated to the band and to live performance, was not a prolific solo artist. Albums trickled out over the years. Each of Allman’s solo albums is worth hearing. They provide at times a clearer look at his musical taste and values than the Allman Brothers Band, to which he was likewise devoted. If you can find the bootleg recording of Gregg Allman with the Alabama All Stars, which includes most of the musicians from the famous Muscle Shoals Swampers, it is well worth your time to hear. 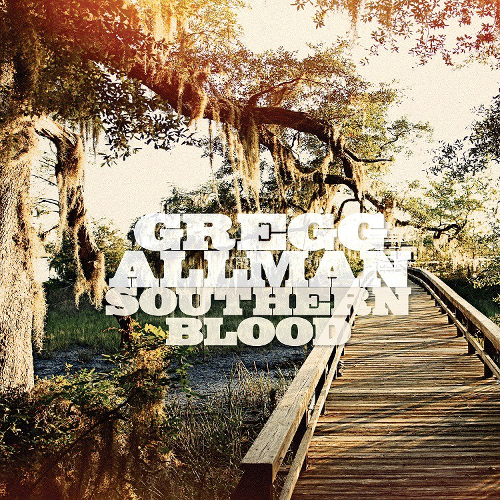 But Allman saved his best for last with his posthumous album Southern Blood, an album he finished only days before his death on May 27, 2017. The album opens with the only Allman original on the recording, a plaintive testament titled “My Only True Friend,” in which he tells a listener (his brother Duane? A wife?) that the road is the only place he feels comfortable. This serves as an apt memorial for a man who spent so much of his time on the road playing for audiences large and small. The rest of the album is taken up with well-chosen covers. Allman digs deep into the catalog of some of his favorite songwriters. “Black Muddy River,” one of Robert Hunter and Jerry Garcia’s most haunting ballads finds a new incarnation on Southern Blood. Say “The Dead” and too many might expect a shopworn cover of “Friend of the Devil” or “Truckin.’” It’s a testimony to Gregg Allman’s discerning taste that he went deeper into the catalog of a band he shared the stage with many times. Likewise “Going, Going, Gone” is a surprising pick from Bob Dylan’s voluminous catalog. A barely noticed cut on Planet Waves, it fits nicely with the album’s mix of hope and mortality. Gregg Allman knew this would be his last album, and by all accounts he wanted to include songs he loved on it. I rarely claim that a cover is better than the original recording but that might be the case with “Song for Adam,” Allman’s remake of a song penned by his old friend Jackson Browne. Browne and Allman met in California in the late 60s when Allman’s contract with a record label held him hostage in LA while Browne was writing the songs that would make him a household name a few years later. In Allman’s version of his friend’s song, the tale of brothers on the road resonates with memories of the fallen bandmates and friends who seem to live again in the lonely hallways of his voice. There are plenty of rockers here as well. “Blind Bats and Swamp Rats” simmers with a touch of New Orleans funk. “I Love the Life I Live” is a final blast of rock and roll defiance. Gregg Allman was one of the great singers America has ever produced, and he was confident enough to never go chasing fads or ducking into the Great American Songbook. He learned early that he liked R&B and blues and he became a peer of the blues singers who were his heroes when he and Duane were forming their first bands. The lonesome blues I heard in Gregg Allman’s voice the first time I heard “Statesboro Blues” is a bit more lonesome now.